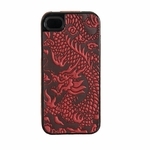 Here, you'll find fancy iPhone cases to spruce up your phone! These leather-clad, precision-made, hard rubber cases have amazing fit, finish and hand feel. Slim, light, and flexible, while offering real protection, this is an all-around great case you will be proud to own.